Pura Meru a great and admirable work of the people of Bali, located opposite the Taman Mayura and built simultaneously in the same year (1720), where the temple is in the middle of town Cakranegara, easily accessible, many public transport and close to the hotel, both star and Melati hotels. 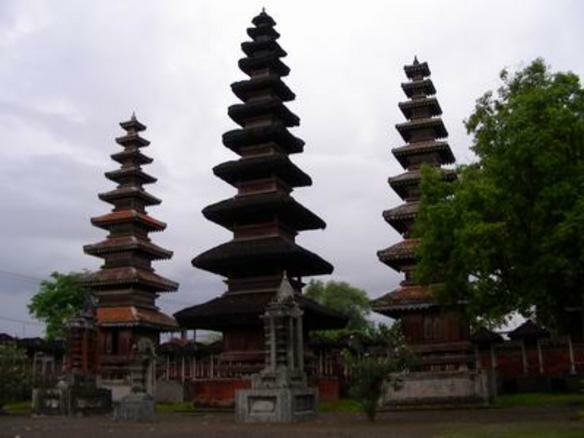 Pura Meru, situated in the middle of the city was built in 1720 Cakranegara under pangawasan Anak Agung Gde Karang Asem King Karang Asem one who can master some area of ​​Lombok Island, came to power in 1740 -1894. This temple is a large temple in P. Lombok and one of the temple is very interesting and beautiful, Pura Meru is built with a view to the worship of Hindus in Lombok, Meru Temple consists of three pages wide mebentang from west to east, the west there is a home page "Kulkul" or kentongan, pages the middle there are two large buildings that beundak-steps (stairs), this building was used for preparing the offerings for Ceremonies and praying while the pages are the most easterly building three high-rise towers containing an array of distinctive and unique roof, flat roofs on eleven central tower, and nine flats on the left and right tower, a symbol of Lord Shiva, Vishnu and Brahma. To get to the location Pura Meru is very easy, because it is located in the middle of the city and many common vehicle through which. Besides Taxi, public transportation is public transportation that can be used (bemo) transport that many people operate on the road, with relatively cheap rates and traditional vehicles cidomo, or horse-drawn carriage. Distance from Sheet Harbour ± 20 km, while from the Airport Selaparang ± 5 km.